Totally trashed: seven year old unnamed pond plant, brand new filters, brand new pump, lemon bacopa, dumped rocks and mud, and three scared fish. And where was the owner of this destructive critter? “Busy”. Entitled “busy”. My foot. I want my leash back and an apology. But when one is “busy”, one’s time is too important for such an endeavor. Hey, did you not notice me drenched from head to toe when you drove up in your brand spankin’ new white mercedes suv? Did you not notice the terrified next door neighbors’ 18 year old cat dying of heart failure? The cat that the your precious killer pooch decided to hunt down once she finished her bath. NO! You were more concerned about having to put a muddy wet dog into your fancy-pants-mode of transportation. Fortunately for you, you don’t live on my block. And where’s my leash? I know that you probably have a large collection of leather designer accessories for your well-trained princess and trophy husband and would not need my humble black-canvas-Petco-variety. So can I have it back? Well, it’s all fixed now. Seven (unplanned for) hours later after searching, driving, buying replacements, and cleanup, I now have my pond happy again. It took several hours waiting for the mud to clear up before I could do a fin count. All three fish were still there and intact. Small miracle. The above photo is of the replacement for the seven-year plant of an unknown name, and it’s called a Water Poppy. It’s perennial and will die back to its rootball in the winter and then reemerge each spring. 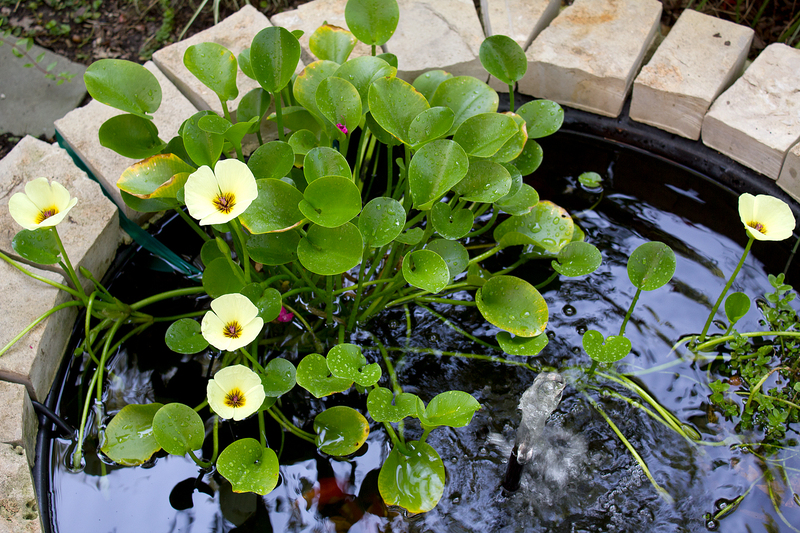 AND it tolerates shade and constant water movement, unlike the lily pad varieties. I like this much better than the seven-year plant of an unknown name.